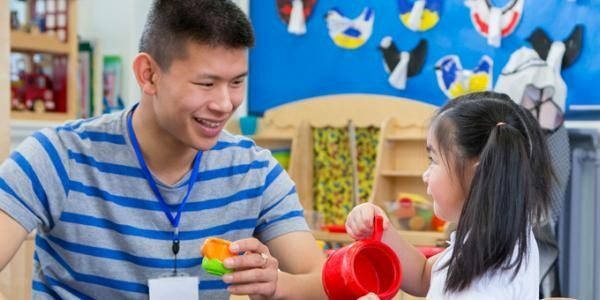 Many preschool classrooms include learning centers (for example, a writing center, a science center, a water table) where children use hands-on materials to explore, play, and learn about specific topics. Bring the spirit of learning centers into your home with prop boxes—plastic bins or cardboard shoe boxes you fill with materials and props related to one topic, such as math or writing. Blocks. Store proportional wooden blocks or colorful pattern blocks in plastic tubs, along, with clipboards, paper, and crayons. Children can create buildings and roads, then make signs to go with them. .
Pretend play.Fill a box with clothes such as dresses, shirts, and suit jackets. Add accessories like hats, scarves, neckties, bags, and jewelry to make children’s pretend play more exciting and elaborate. You could create separate prop boxes for different play themes—for example, a small briefcase, notebooks, paper, and pens for a prop box related to office play. Let the children’s interests and imaginations guide their selection of clothes and props. Art.Keep a box handy with different types of paper and drawing and painting materials. Add safety scissors and paste, so children can make collages or experiment with other art techniques. Math.Include board games and puzzles. Add empty, clean, egg cartons or ice cube trays and materials for sorting, like buttons or old bottle tops. Add materials that children can use in inventing their own games—paper, crayons, and dice, along with pennies or buttons to use as player pieces. Add a ruler, a tape measure, and other items for measuring size and distance. Reading.Store fiction and nonfiction books and magazines your child will enjoy in a basket that can be carried around the house or even outdoors. At bedtime your child can move the book basket near his bed for easy bedtime reading. You might also set aside a shelf in your child’s room or make space on the bookshelf where you store your reading materials. Writing center.Fill a basket with paper, markers, notebooks, pens, pencils, envelopes, a ruler, stationery, and note cards. Your child can set up the writing center wherever she wants to write. Water play. The bathtub and the kitchen sink are logical locations. But a small basin on the floor can also work (place the basin on a towel with a plastic trash bag spread beneath it to catch spills). Fill a plastic container with props such as sponges, basters, colanders, strainers, pitchers, tongs, and so on. Cooking. Store a child-size apron, a collection of favorite recipes, and unbreakable bowls and utensils in a kitchen drawer or bottom cupboard. Invite your children to join in while you prepare meals and snacks. Get them in the habit of washing their hands before and after handling foods. Music. Use oatmeal containers, old yogurt cups, and other materials you have on hand to make homemade instruments (like a rainstick or a drum) with your children. Store these instruments in a box and add other items, like castanets or maracas. Children love to create music while singing with family members or making up silly songs together. Science. Make science a routine activity by filling a box with a few investigation tools, such as magnets, prisms, a magnifying glass, and binoculars, along with a clipboard, paper, and crayons or pencils. Take a walk to collect natural items, then invite the children to investigate them using the tools. Ask questions such as “What do you think might happen?” to help them observe and make predictions. Label the prop boxes with words and a picture or photo of what’s inside, so children can easily identify the one they want to use. Store the boxes in a closet or even under a bed—wherever it makes sense in your home, as long as you and your child can reach them readily. If your child has never experienced an activity such as water play, introduce him to the activity and model the use of materials in the prop box by playing along for awhile. Take cues from your child. If she wants to write or draw, bring the appropriate prop box to a table and let her explore and make her own discoveries. The same goes for music or playing with math materials. One final thought: you can ask your child’s teacher about prop boxes. She may suggest supporting your child’s learning at home by repeating the kinds of activities your child enjoys at the program. Laura Colker is a contributing editor for NAEYC’s magazine for preschool teachers, Teaching Young Children. This article was adapted from an online Q & A about Learning Centers that took place in January 2013.